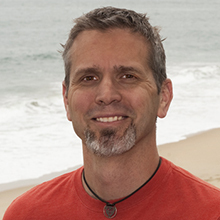 Chad joins MBARI as a Research Specialist and comes from Oregon State University where he was a Senior Faculty Research Assistant in the College of Earth, Ocean, and Atmospheric Sciences (2002 to 2016). Chad has a Bachelor of Science in Natural Resources Management, Grand Valley State University. In addition, Chad has received several certifications from the Marine Advance Technology Education (MATE) program, including “BoatUS Boating Safety Certification” and the “American Academy of Underwater Sciences Scientific Diver Certification.” Chad possesses a strong and demonstrated background working with acoustic data and instruments. Chad’s primary responsibilities will be to continue working in support of Kelly Benoit-Bird’s research program and provide key technical and analytical assistance.